Wish someone congratulations on a new job or an exciting move with this dynamic pop up greeting card. 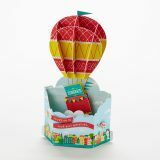 A gentle squeeze of the card base makes this colorful, three-dimensional hot air balloon fly high over the town, headed to its next adventure. Sign the removable mini card that peeks from the balloon basket to preserve the papercraft memento so it can be enjoyed again and again. Wonderfolds bring a whole new dimension to card giving.